It is with great sadness we report the death of MORF Tech founder Frank Springett. While we cope with our loss, sales and distribution of MORF Technologies Trifold Bar will be temporarily suspended as we restructure our management. We will respond to e-mails and address customer inquiries during this transition. We appreciate and thank you for your patience in this very difficult time. Please check back to this website for updates. Thank you for your interest in MORF-Technologies. Our bars are on temporary back order. We will be back up soon! We have received so much great feedback. We want to hear it, both good and bad, so thank you!!! Below are some answers to some common questions and queries. Safety is first and foremost in our design and philosophy. Not only in operation, but in the redundancy in the design, specifically around the locks. LOCKS - The bars lock in the touring or upright position. There are two lock pins, released by two separate release levers and the bars are mechanically linked so both must be disengaged in order to transition to the aero position. One lock engaged is sufficient to hold the bars in the touring position. In short - there is redundancy in the locks. SAFETY FACTOR - The design safety factor is at a minimum 3:1. TESTING - Prior to release, load test, cyclic testing and vibration testing are planned. The first prototype has over 2500 miles on them where we learned a lot about the mechanisms which have been incorporated in the latest design. The system has a large range of adjustability. 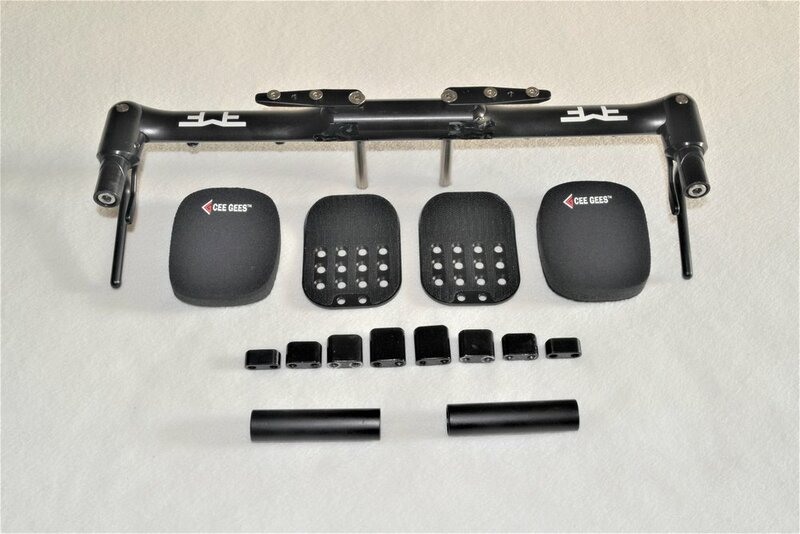 The arm pads rotate relative to the bars and different spacers are available which allows for lower mounting of bars for the touring position and the bars can pivot up to the touring position. Any bar end can be used from straights to ski bend. AERO TESTING - We have done some preliminary testing at Faster in Arizona, it was a quick test to confirm that the bars are faster. Initial data confirmed no base bar has less resistance than a base bar. We will be following up with additional wind tunnel testing in the months to come, once we have more concrete data we will share it on the site. WEIGHT - The current billet aluminum unit with CeeGees pads and brake assemblies weigh in at 950 grams. BTA - A small bracket mounted on the arm rest assembly with the standard bottle cage mount holes will be available. Bike computer mounts can be affixed to the same bracket. An example of how that works can be seen in the photos below. For Frame mount bottles with drink tubes - A small bracket used to affix the drink tube and bike computer mount will also be available. A great unintended consequence of the MORF TriFold bars is ease of shipping. No need to remove the cockpit, just loosen the stem bolts, fold the bars into Aero and drop the bars down to the forks. Getting the bikes ready to ship from Interbike - Doesn't get more compact than that! ISO Testing Complete and passed!!! We have run through the ISO 4210 testing and successfully passed the in phase (400N), out of phase (250N) and static load test (1000N). We also ran an internal test of 50,000 open close cycles with no issues. Currently the bars are approved for use in USAT and WTC (Ironman) events. We are working on the additional approvals. Our initial focus has been around the Tri community but we are working on the TT cycling rules as well. We will keep you posted. We have finalized our manufacturing processes and have completed our first production run. The bars are now available for purchase! Click Buy on the menu to buy yours today. Product ships in 24 hours and there is a 90 day, satisfaction money back guarantee.